Ideal Industries TightSight™ 700 Series true RMS clamp meter with 2-Inch jaw opening, offers high frequency rejection to measure accurately. The digital display displays feature large numbers and green glowing backlight for easy reading. The meter includes leads, alligator clips and nylon carrying case. It has a voltage rating of 0 - 750-Volts AC, 0 - 999.9-Volts DC at 20 - 400-Hz and current rating of 1000-Amps AC. It offers capacitance of 0 - 999.9 mF, resistance of 0 - 9999-Ohm and operates at a temperature of -20 to 70 deg C. On-screen low battery indicator warns user before shut off to resolve inaccurate readings. It offers selectable audible and visual voltage alerts on AC/DC voltage functions. 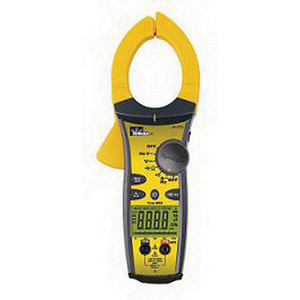 This clamp meter is suitable for a variety of industrial and commercial environments. Meter is cULus listed and CE certified.